Strictly speaking, window boxes do not come under the gardening category of planting or landscaping the grounds, but in a vital way window boxes serve to tie the house to the lawn and gardens and thus help to produce the immediate effect of a harmonious space. The garden boxes are particularly valuable in conveying a cozy and lived-in atmosphere to a new house. Many otherwise monotonous houses have been made very attractive through the use of successful window box ideas. A stark style of architecture benefits from window box designs developed with the heavier kinds of foliage plants such as English ivy, geraniums, and fuchsias, while a lighter architectural design requires vincas, snapdragons, and ageratums. The selection of window box flowers and plants for successful windows boxes must be the result of some study of the effect to be produced and the kinds of materials necessary to produce the effect. Not all plants can be used with window planting boxes. Plants for this purpose must retain their foliage throughout the summer, the period of bloom must continue for a number of weeks, and the normal growth of the plant should not be impaired by crowding the root development within a small area. 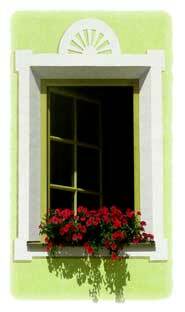 Two cardinal principles apply to window box gardening and the overall use of window boxes. 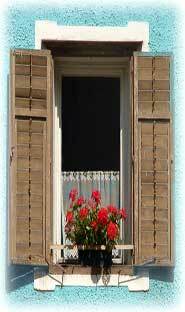 It is not possible to put window planters on all house window styles unless the architectural composition requires them, and do not select plants which are out of scale with the architectural detail. When planning the window boxes the effect of the color scheme should be considered from the inside of the various rooms in the house as well as the effect upon the aspect of the house itself. There are numerous possibilities outside of the conventional planting boxes filled with periwinkle, geraniums, and daisies. warf giant-flowering snapdragon comes in many brilliant shades and grows about twelve inches high. The dwarf zinnia is perhaps even more brilliant in its various colors for a window planter. It is also stiffer in its habit of growth and consequently better for a windy location. California poppies can be had in all shades of yellow and orange and could be used with nicotiana for a white and yellow window flower box. Another good combination is blue lobelia, pink verbena, and asparagus fern. Care should be taken to select the flowers which will bloom simultaneously. Foliage plants should be used to provide an abundance of green, and enough vines and flowers of a drooping habit should be introduced to counteract the stiffness of the window box. When planting, pack the roots in firmly on account of the wind. For an unusually windy position it is best to use a deeper windows plant box. In choosing the plants, exposure is the first important consideration. For sunny positions the more vigorous growing and flowering plants are apt to do best, while in shade ferns and foliage plants, generally speaking, are more successful in window planters. In a dusty location smooth leaved plants such as myrtle and ivy geraniums should be used. 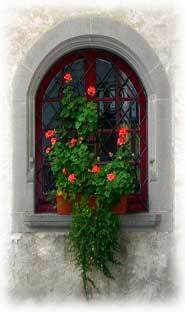 The soil used in all window boxes must be rich, as the roots are so crowded and ample plant food must be available.